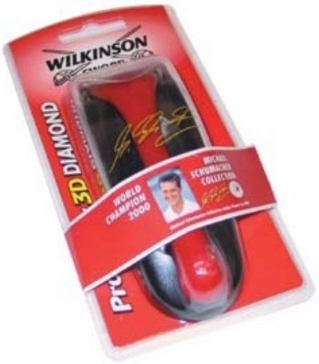 Michael Schumacher Wilkinson Sword Protector 3D Diamond Shaver. Very high quality wet-shaver with MS Speedline logo on the shaver itself and facsimile signature on the cover. Protector 3D Diamond combines Wilkinson Sword’s revolutionary three-dimensional movement and ultra thin protective wires with Alpha Diamond blades for the closest and safest Protector shave ever. 3D action provides optimum blade-to-skin contact even in hard-to-reach places and our patented Alpha Diamond Blade Coating technology significantly reduces blade edge breakdown, which helps you to get an exceptionally close and smooth shave.